This is the top story on Weibo rn, pushed to all users: surge in hate is “because Trump *protesters* blame Chinese Americans”. Y’all. 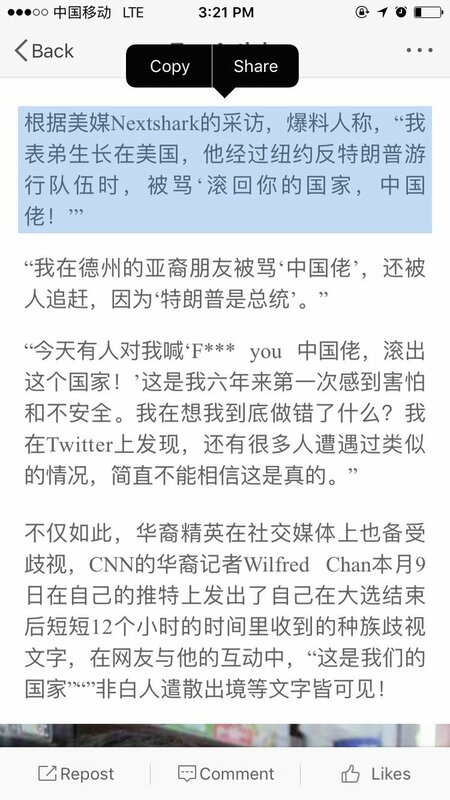 The account lists a number of stories about racial slurs (including @wilfredchan). 1st one explicitly blames protesters; rest is implied. 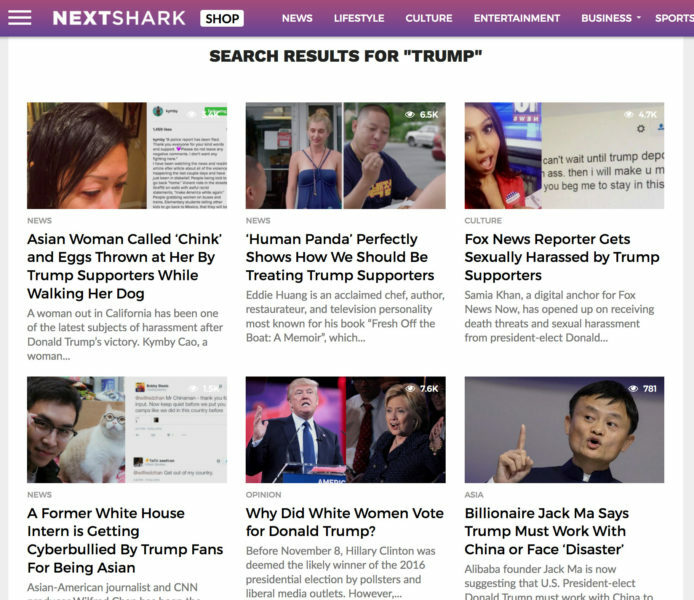 A search for “Trump” on NextShark reveals only anti-Trump stories. Retrieved November 14, 2016. This was published by an account called 美国大学百科 (Encyclopedia of American Colleges). This is HORRIFYING. Two possibilities here: 1) genuine, DEEP ignorance leading to misunderstanding of stories stripped of context. Unlikely but fucked if true. 2) More likely and much worse: 1 but willfully directed by someone(s) stoking support of Trump + defensive ethnocentrism. I can’t. Chinese American 2+ gen: PLEASE talk to your parents and family friends. 留学生 please reach out to your friends and networks. This is not OK.
Takeaway isn’t “wtf China”; it’s that THIS is the level of truthbending made possible by erosion of trust in media. USA heading there too. Read the original twitter thread. You are jumping the gun here a bit. 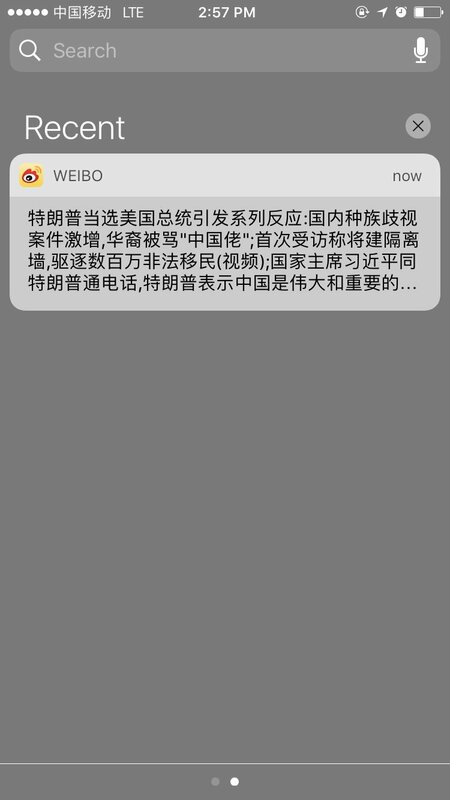 The first Weibo post (with a grey background) does not state any causality between protesters and Chinese Americans being insulted; it just lists the result of Trump being elected as “a rise in racial discrimination, Chinese Americans being called ‘chinks,'” and ends with “Trump affirms the greatness and importance of China.” This is just a news piece that is fairly neutral (by Chinese standards) reporting on how Trump’s election has impacted Chinese Americans and China. 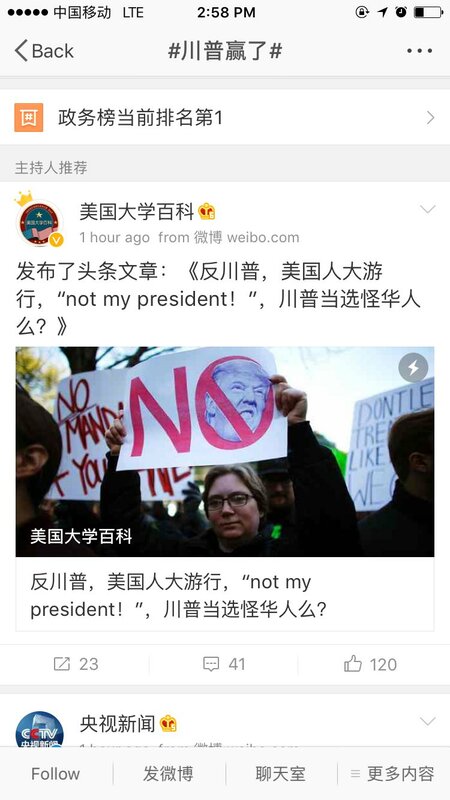 In addition, the post from 美国大学百科 is composed of a series of statements, the last of which is a question asking whether Chinese people contributed to Trump being elected. It is possible to read causality into the post, but given its brief nature, it was probably just a series of interconnected statements written in a hurry. Hi @Shan – maybe our follow-up article will clarify your concerns? While what you point out is correct, there’s other extra information we didn’t have time to put in our initial short post. It was the Mic.com article that lead me here, since this is the post they linked to. The majority of Mic.com readers (which is a significant number) will not be able to read the Chinese that this post cited. I have already written to the writer at Mic.com with a full translation of everything here, and also reminded them that these were speculations. Of course it was also up to them to vet their sources, but your blog should also try to put up evidence for your claims. I am really concerned about this because while outright racism is a problem, liberal Americans thinking feeling like they have somehow “saved” Chinese Americans from a corrupt state is also a problem. Unfortunately the Mic.com article feeds into that tendency. Definitely echo your concerns about journalistic integrity, which is partially why we took the extra time out to translate the text in Christina’s original tweets (which, I believe were the original source of the story more so than our blog post – our blog post has only received a modest amount of traffic compared to the many many retweets of the original twitter thread). Unfortunately, there’s a limit to what we can do – the current model for online journalism is heavily based on volume and speed, and asking them to wait a few days for us to write our own full account of the event doesn’t fit into that model. Thanks again for correcting the folks over at Mic, and for stopping by.